EDMONTON—The Boreal Electroacoustic Music Society will commemorate 10 years of Art’s Birthday Edmonton with a special show taking place Saturday, Jan. 14 at the Ortona Armoury (9722-102 Street). 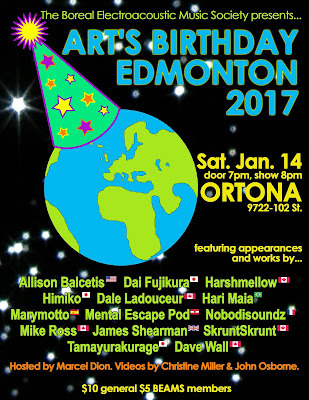 The event, Art’s Birthday 2017, pairs seven local acts with works by seven international composers and soundscape artists, some of whom created works specifically for this occasion. Women will comprise the majority of local performers gracing the stage, with pianist Himiko, saxophonist Allison Balcetis, noise duo Harshmellow and Chapman stick player Dale Ladouceur slated to play. Rounding out the live lineup will be keyboardist and music journalist Mike Ross, software sound designer SkruntSkrunt and guitarist Dave Wall. Works will be by Dai Fujikura and Tamayurakurage (Japan) Hari Maia (Brazil), Mental Escape Pod (Austria), Nobodisoundz (France), James Shearman (England), and Marymotto (Spain). Videos will be courtesy John Osborne and Christine Miller. Art’s Birthday originated in 1963 when French surreal artist Robert Filliou declared that art didn’t exist until a million years ago when someone dropped a dry sponge into a pail of water. Choosing his own birthday of Jan. 17 to celebrate the event, Filliou proposed a public holiday, which has since been adopted by arts organizations and collectives in more than 20 nations worldwide. Edmonton first held such an event in 2008, presented by the Film and Video Arts Society at the now-defunct ARTery. The Edmonton Arts Council staged Art’s Birthday at Scona Pool the following year. Since 2010, BEAMS has facilitated the event annually. Doors for Art’s Birthday open at 7 p.m., with the show starting at 8 p.m. Tickets are $10 at the door. BEAMS members get in for half-price.